It’s no surprise that I was ecstatic when I heard that Aerosmith was releasing a new track. When I heard it I was even more blown away by this true return to form for the bad boys of Boston. The track is entitled “Lover Alot,” and is probably my favorite Aerosmith track since their 1993 album, Get A Grip. The track is a perfect mold of modern Aerosmith and the earlier grittier sound of the band. Right off the bat the listener can tell their in for a treat, especially when the song starts off with the drums of the hard-hitting, Joey Kramer. Then all of a sudden the listener gets hit by the riff and Tyler’s vocal on the chorus. It really sticks to the adage; don’t bore us get to the chorus. The verse comes in next and it sounds a lot like late 70’sera Aerosmith. Especially Tyler’s vocal phrasing which in the verse is very reminiscent of the great track “Chiquita.” I also like how the guitars are very gritty, but it is the thudding bass that drives the verse. The song also features a blistering solo that to me sounds very effect driven, but hey it’s smoking so that shouldn’t matter. 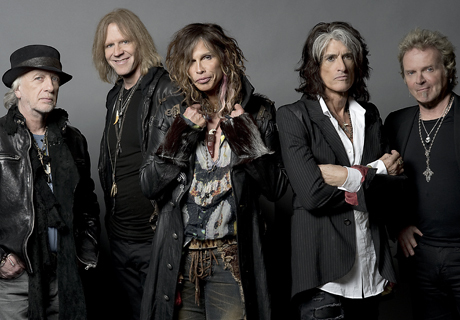 If Aerosmith’s new record is anything like the three tracks I’ve heard so far I’m sure it will be awesome. I can’t wait to hear what comes next from these local heroes. Fantastic! Oh, how I want to see them live… that would be so fabulous!